Flight compensation claim rejected? We can still help! 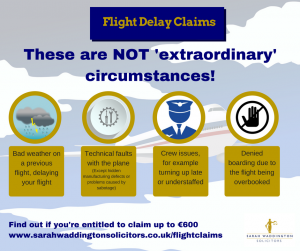 Many airlines will cite ‘extraordinary circumstances’ as the reason for a flight delay or cancellation, and as a result advise passengers that they are not entitled to compensation. We have found time and time again that this is often, simply not true. Like in the case reported in the national press yesterday (Mirror.co.uk) airlines are claiming extraordinary circumstances in the hope that claimants will not take the matter any further, because they know members of the public are unlikely to take them to court. Last month we successfully contested the defence of extraordinary circumstances, by British Airways, in the smalls claims court and the judge ruled in our favour. The reason for the delay was ruled in fact not extraordinary and BA were told to pay our clients compensation of €600 each. We understand that for many people making a claim against an airline can be a very daunting experience and the hassle, time and money involved is a key factor in deciding not to pursue a claim. Our expert legal team are here to make it easy for you to get the compensation you deserve. If you’ve experienced a flight delay or cancellation and been told by the airline that you’re not entitled to compensation, don’t take no for an answer! Let us look at your case for you, no-win, no-fee. We can review your flight delay for you and handle your claim, including legal proceedings to fight for compensation on your behalf if necessary.